I have a confession to make: I don’t really know how to start writing a review about The Stand. Part of this is because it’s difficult to write a review and contribute something to a book that has become so monumentally huge. Another part is that it’s just so long and there is so much to talk about here. Stephen King’s epic post-apocalyptic narrative is, without a doubt, great literature. It is not popular fiction, as perhaps most of his books are. With this one he cracks his way into the shared light of authors such as Charles Dickens, and J. R. R. Tolkien. A plague, colloquially known as Captain Trips, ravages the world. After the veil of civilisation has fallen the story follows numerous different characters as they all begin having shared dreams, or more appropriately, visions. Visions of two people – Mother Abigail, a kindly ancient old black woman, and Randall Flagg, evil incarnate. They are summoning their people for a final reckoning. A vast cast of characters will have to find their inner courage and make a final stand in the battle of good and evil. 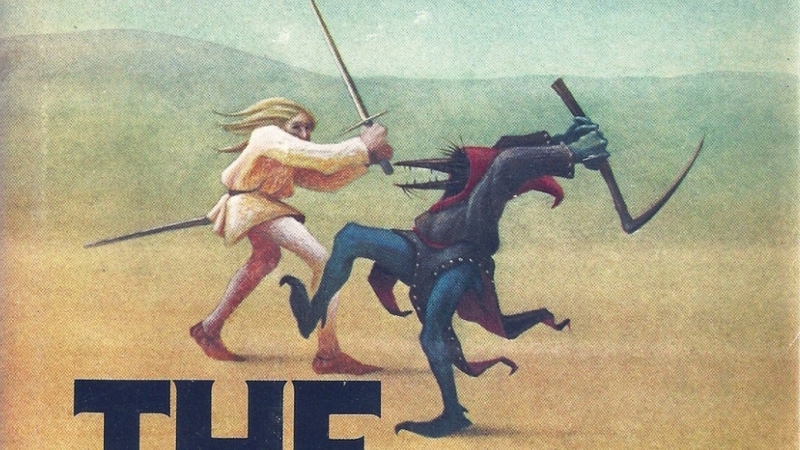 … instead of a hobbit, my hero was a Texan named Stu Redman, and instead of a Dark Lord, my villain was a ruthless drifter and supernatural madman named Randall Flagg. The land of Mordor (‘where the shadows lie,’ according to Tolkien) was played by Las Vegas. 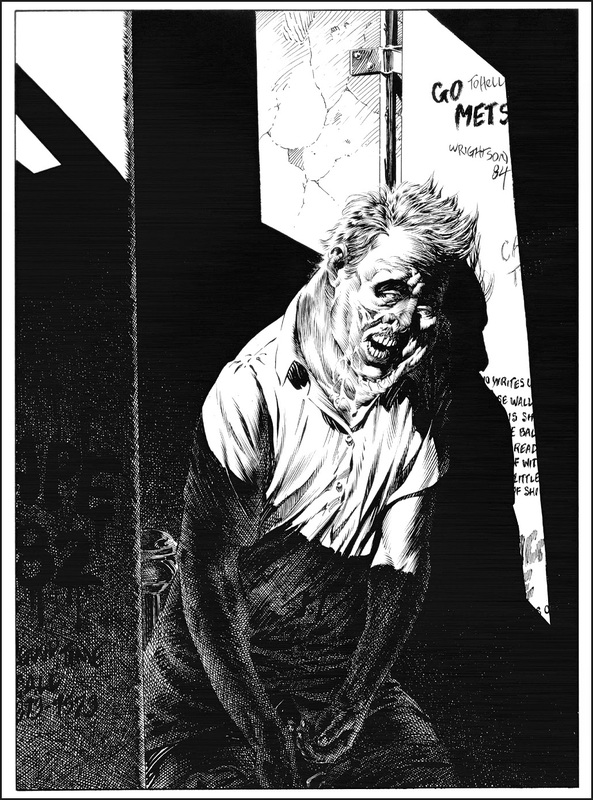 One of the billions of victims claimed by Captain Trips, as illustrated by Bernie Wrightson. What Stephen King brings to this epic narrative of good versus evil, though, is his brilliant writing of characters and psychology. The narrative is actually very simple – the remnants of society form two groups of people, and they must battle for the fate of mankind. It’s a much simpler story in many aspects than Tolkien’s own Lord of the Rings. What makes the page-count so high then is the amount of time that King devotes to exploring all of his many characters. He builds characters you will never, ever forget – Stu Redman, quite, wise, and heroic; Larry Underwood, a man in eternal combat with his own inner darkness; Frannie Goldsmith, loving and devoted; Nick Andros, mute and deaf but ever resourceful and caring; Harold Lauder, jealous and hateful; Tom Cullen, kind and brave. All of these characters, and others including the Trashcan Man and Lloyd Henreid, explode on the page. None of the plot feels forced or controlling. Everything that happens feels like a natural outcome of each character’s unique personalities. All must ultimately reckon with Randall Flagg, which brings me to perhaps the best part of the novel. Randall Flagg is Stephen King’s archetypal portrayal of evil. He appears in many other novels, such as The Eyes of the Dragon, and he is a major character in his fantasy epic The Dark Tower. He is, without a doubt, one of the greatest literary villains I’ve read. He is ephemeral, yet powerful. You’ll get the chills whenever he appears on the page, or whenever he uses his magic to torture and maim. He’s not really in the novel that much – he appears mostly in dreams and nightmares to the main characters, and occasionally is in contact with the rest of the citizens of Las Vegas. It’s only really the last third of the book in which he truly appears, and the build up to his character pays off. It’s truly stunning to witness such an amazingly written character appear. 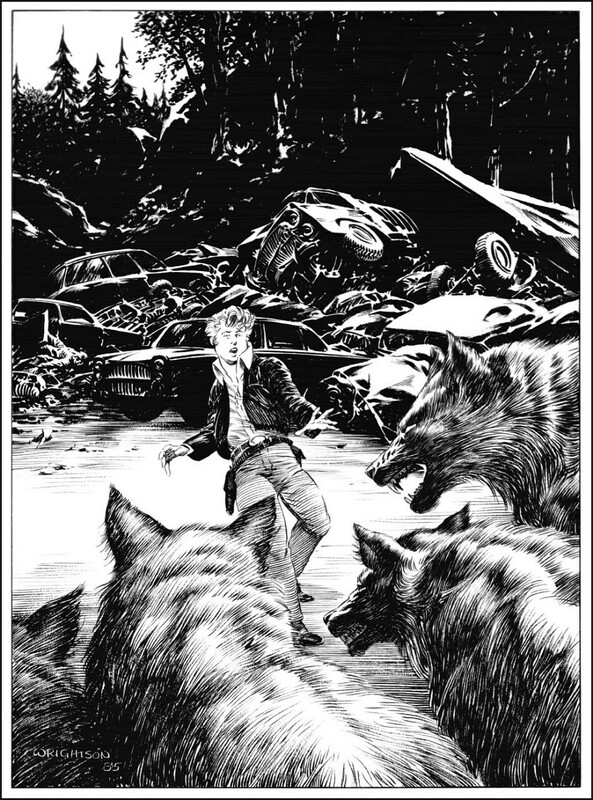 Bernie Wrightson illustrates the scene where the Kid is put to death by Randall Flagg via a pack of wolves. Another great aspect of the novel is seeing how both civilisations reform. Witnessing the rise of the Boulder Free Zone is stunning stuff – you’ll share in the character’s jubilation as they heal from the nightmare they’ve all been faced with. Moments such as when, at the first political meeting of the Free Zone, everyone stands and sings the national anthem (well, apart from Nick Andros) will fill you with heartache and make you tremble. Others such as when they finally manage to get the electrics working again fill you with joy. It’s one of the novel’s most interesting and well-thought out aspects. I cannot recommend this book enough – it is a masterpiece of fantasy and science fiction writing, and truly King’s best work. In many ways it could be considered a definitive American narrative, in the way Lord of the Rings could be considered a definitive British one. Search it out at all costs. You will fall in love with the characters and be utterly thrilled, horrified, and compelled by this narrative. Read it at all costs. King, Stephen. 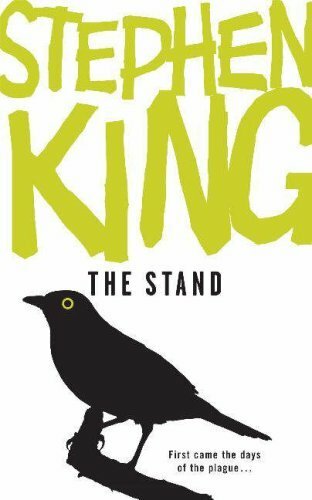 “The Stand: The Complete & Uncut Edition: The Inspiration.” StephenKing.com. Stephen King. Web. 4 Sep. 2015.